The genus Anthurium represent the largest group of species in this family. With over 600 species that originate in the New World tropics, only two have had widespread cultivation. Anthurium Scherzeranium (say that 3 times real fast) which grows in the mountain regions of Costa Rica, has become a popular houseplant in Europe but has had little cultivation in the US. On the other hand Anthurium Andraeanum is grown by the acre in Hawaii for its long lasting cut flower and has become one of the symbols associated with Hawaii. In the past, Anthurium Andraeanum was grown for the cut flower trade. Red, pink, orange and white colors with 1 or 2 flowers per plant. These plants were too tall and spindly to be used indoors. In the early 70’s the variety Anthurium amnicola (formerly known as A. lilacinum) was introduced to the horticutural world. 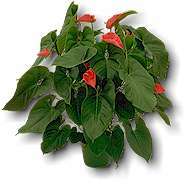 This introduction has changed the face of Anthurium production. Amnicola is a true miniature, no more than six to eight inches in height, with leaves that are narrow and dark green. What’s the Big Deal about Amnicola! The big deal about amnicola is its flower. A small flower that is lavender in color, it emits a pleasant fragrance and, quite frankly, flowers like crazy. The plant is very capable of being in flower year round. Another benefit is that it suckers readily, forming tight clumps. This plant paved the way for most of the anthuriums we see in pot culture today. The introduction into the breeding areas of Hawaii and Florida has resulted into many new hybrids. These plants are short in stature, have lots of flowers and provide many new colors. One of the most popular introductions has been the ‘Lady’ series from Oglesby Plants International. Their release of Anthurium ‘Lady Jane’ and the University of Florida’s introduction of ‘Southern Blush’ has renewed interest in this group of aroids. Indoors Anthuriums can be used as free standing specimens, or plunged into beds. Either way the same general requirements should be followed. One of the keys to using anthuriums indoors is to use mature specimens. Small plants can be difficult to establish in an interiorscape. Even mature specimens will need to become acclimated to the light and temperature of their new environment. You can also expect some loss of older foliage while acclimating. You’ll find most of the plants available in 6" and 8" pot sizes. These plants have been bred for sales in these pot sizes, so don’t shy away and think that they are not mature plants.